The main function of your dog’s hip joint is to attach the rear legs to the rest of the body and support the weight of your dog’s body whether he’s standing or moving around. In the world of dogs, hips play an important role in locomotion and when things don’t go as they should, bad hips can trigger crippling lameness and painful arthritis of the dog’ joints. Discovering the important role hips play in a dog’s life is not only a matter of satisfying one’s curiosity, but it is also educational, so that, as dog owners, we can learn how to prevent problems and recognize early signs of trouble so that we can report them to our veterinarians in a timely matter for assistance. 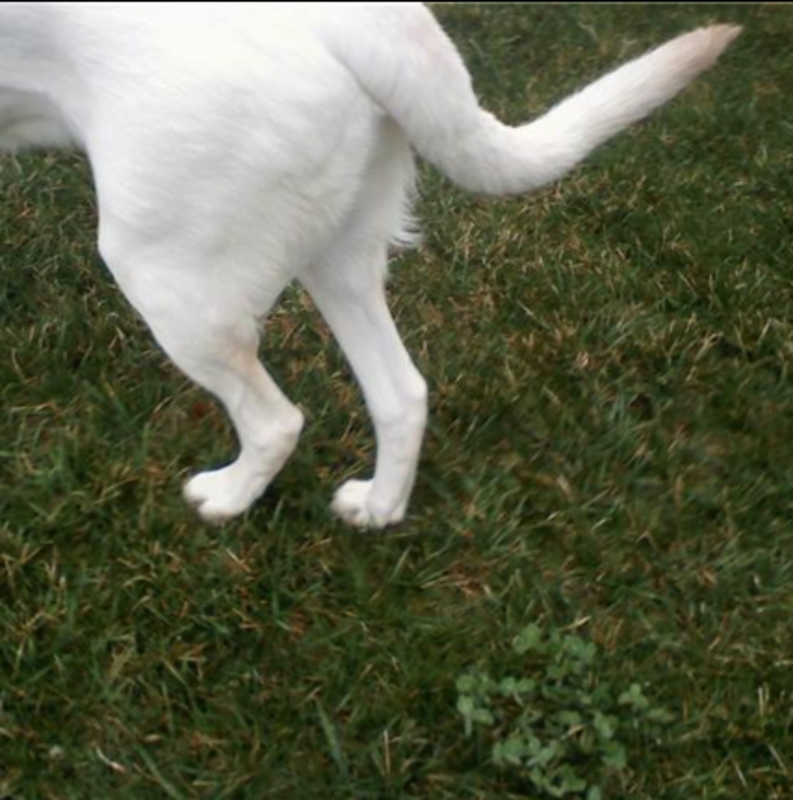 So today, our dogs’ hip joints take the spot of honor, so let’s listen to their story. Hello, it’s your dog’s hip joint talking! Many tend to think of me as a single unit, and for a certain sense I am, but if you look closely I am actually the “junction” of two important bones, the femur and the pelvis. I am known to be a “ball-and-socket joint” and there’s a good reason why. 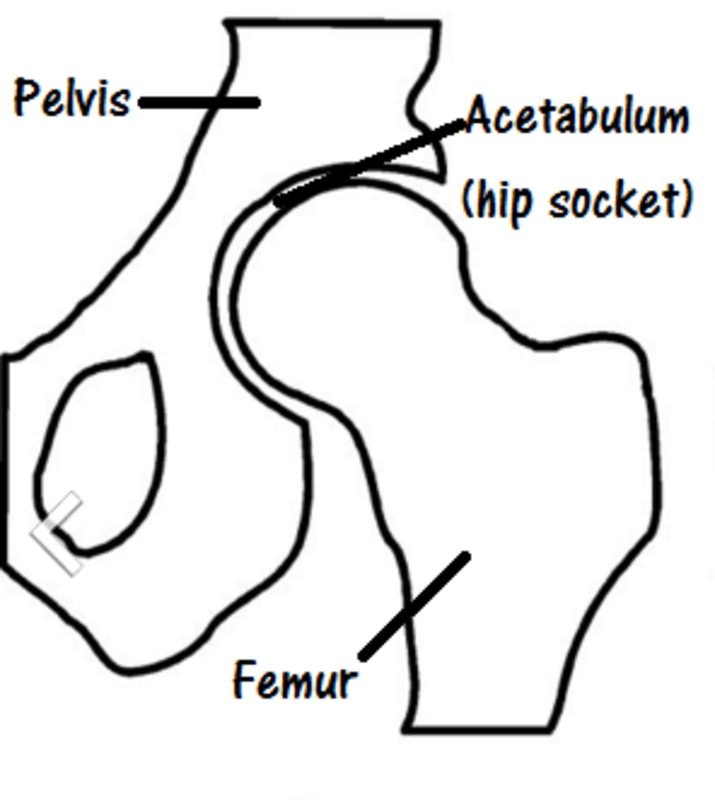 The head of the femur bone (the acetabulum) is shaped like a ball and it fits snugly into the socket of the pelvis. This is a work of art of Mother Nature, as these bones are crafted to match each other perfectly. I am also known for being a “synovial joint.” Because bone-to-bone contact can be problematic in the long run, I am protected in various ways to prevent friction. Firstly, the articular surfaces where the bones meet, are made of a layer of smooth, compact bone. On top of that, a smooth layer of spongy cartilage (articular cartilage) covers the surfaces of the bones where they rub together offering the right amount of cushioning to avoid friction. For sake of comparison, this surface works like the Teflon coating that you would find on pans. Thirdly, in the space between the joint, you’ll find a multi-layered joint capsule which encloses synovial fluid. This type of fluid keeps me well lubricated to further prevent friction between the bones. When all goes well, I move smoothly and offer stability and a wide range of motion in your dog’s day-to-day activities. Things become problematic though when I am not structured as I should. Veterinary surgeon R.D. 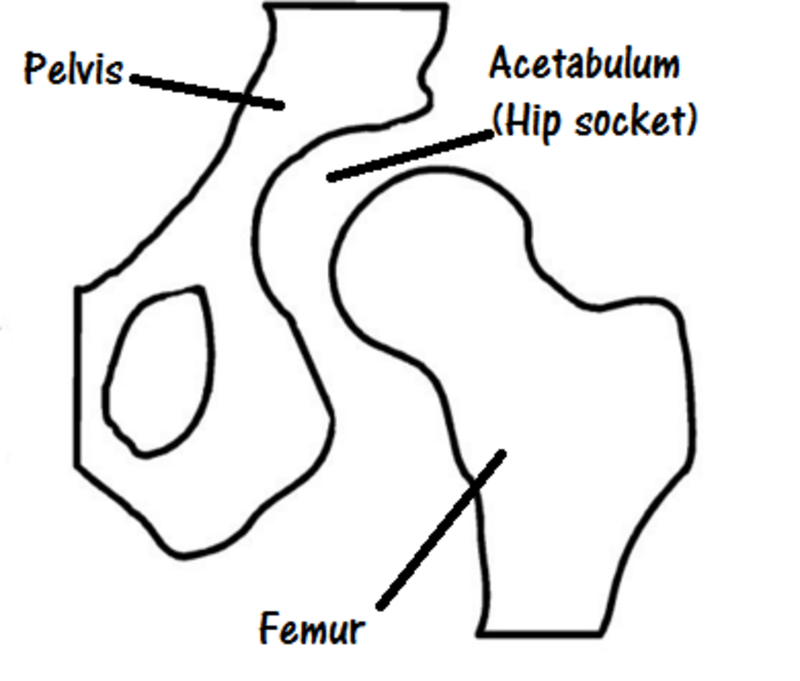 Montgomery explains that puppies are born with a good pair of hips but things then start going downhill during the developmental stage when there’s “a disparity between primary muscle mass and too rapid growth of the skeleton.” When things go south, I become unstable and eventually dislocate (subluxate) and the snug ball-and-socket fit is gone, leading to a condition known as “hip dysplasia.” You see, when there is a loose fit between the bones, there is lots of wear and tear because the ball (acetabulum) is not housed in the socket as it should causing the accelerated destruction of articular cartilage. While many large breed dogs are predisposed to develop chronic problems with me due to conformation, sometimes acute subluxations occur as a result of an accident. In these acute cases, I have good chance of recovering if I am taken care of immediately. In cases of chronic hip dysplasia though I may need to be managed medically or through surgery in severe cases. You see, when I experience a subluxation, I try to remedy to the situation as best as I could by trying to lay down more cartilage, but this takes a loooong time, and unfortunately, by then, the inflammation and pain associated with osteoarthritis may have likely already set in. The more inflammation, the more damage occurs. Affected dogs will do the best they can to not move me as it’s painful, and this often entails moving stiffly when getting up, problems jumping or climbing stairs, a swiveling movement of the hips or bunny hopping, where the dog moves both back legs together instead of swinging them alternately. Some dogs may also keep their legs close together to recompensate for the weak hips as you can see in the picture on the left. When dogs compensate by using their bodies in other ways, this can lead to soft tissue problems. 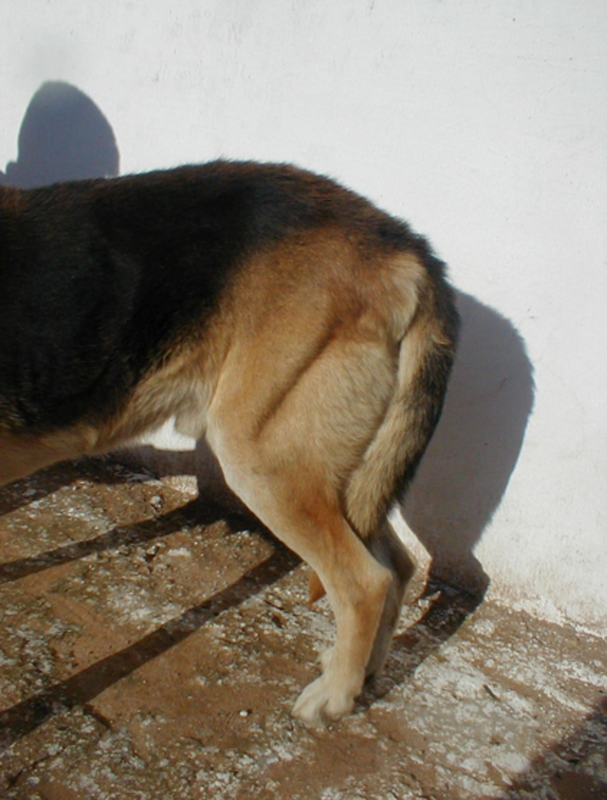 Also, because dogs may not move their back legs as they normally would and they may be reluctant to exercise, their muscles in the hip area may start wasting as seen in a picture in the next paragraphs below. Keep Me in Good Shape! Hip dysplasia has been thought to be a heritable condition, meaning that it is passed down from a generation to another, but new research is showing that the environment can also play a role. If you want to up the chances of keeping me in good shape, you need to really be careful, especially when your puppy is growing. For example, neutering too young may put me at risk for problems. A study found that early neutering almost doubled the chances for hip dysplasia in Golden retrievers. Rapid weight gain due to excessive calories and free feeding, injuries or overexertion at a young age or inappropriate supplementation with vitamins and minerals are also predisposing factors. Jumping activities such as playing Frisbee with a puppy under the age of one year, may be risky business considering that my growth plates are still under construction. Consult with your vet for a proper exercise program for your pup. “In puppies that exercise heavily the laxity is exacerbated and the joint is traumatized by the abnormal motion and impact of repeated subluxations and reductions. This trauma is further exacerbated by increased body weight, causing the joint to withstand even more force. “~ R.D. Montgomery, veterinary surgeon. In older dogs who are already affected by hip dysplasia, weight control is always a plus, less weight mean less strain on me as I don’t need to carry those extra pounds. Exercise is good because you want to keep those muscles strong as they help stabilize me. 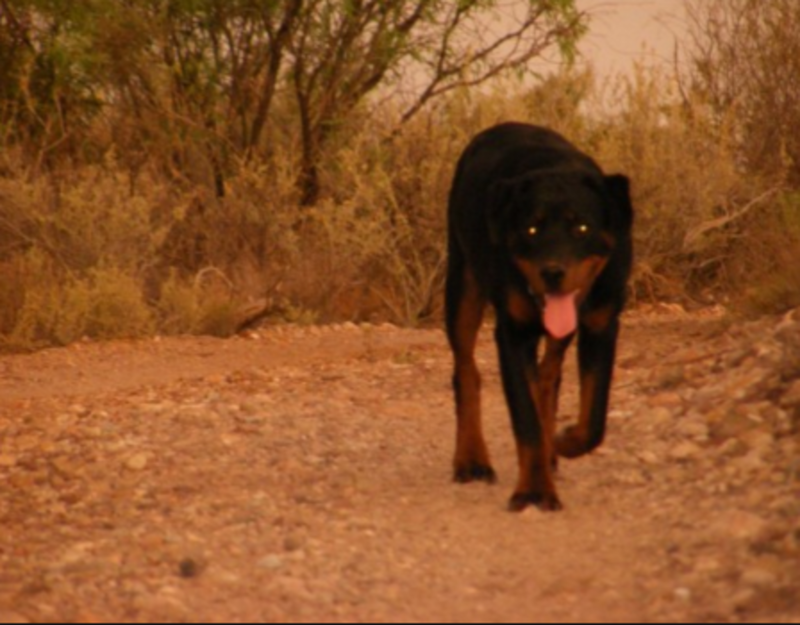 Stop exercising your dog, and you may see the effects of muscle wasting as seen in the dog in the picture. Moderation though is key. Consult with your vet for guidelines on how much exercise and what kind is good for your dog. Most vets seem to agree that swimming and leash walks are good for me, while running and jumping are too high impact and cause me stress and the release of inflammatory mediators which worsen the degenerative process and trigger pain. On top of non-steroidal anti-inflammatory drugs, many vets suggest glucosamine supplements to minimize the degenerative process. Ask your vet on what you can do help me. Those folks interested in breeding large dogs, better test me before breeding their dogs. It’s important that breeders keep this in mind and arrange things accordingly. The Orthopedic Foundation for Animals provides owners with scores that will tell them how good or bad I look based on x-rays. However, don’t just assume that everything is fine if your breeding pair have both impeccable scores. Sometimes, in a blue moon, a puppy will still pop up with bad hips no matter how good those parent’s hips are! “Sometimes the mother and father of the affected puppy are negative for the disease. If this is the case, the parents may have hidden genes for the disease.”~Dr. Daniel A. Degner, Board-certified Veterinary Surgeon. In dogs not meant for breeding, testing me is also important. Your vet can have an idea of in what general state I am when he flexes and extends your dog’s back leg and watches for signs of pain. Your vet may perform the Barlow maneuver, Ortolani test, or in your pups, the Barden test, to check me out, but these tests are often better done when the dog is sedated and I am relaxed ( a dog’s tense muscles may stabilize me temporarily). Upon conducting these tests, the vet will pay attention to any grinding or crunching feelings when he moves me around. Again, an x-ray of me can give the vet a better “picture” of how I look like so he can make the best decisions for your dog. As seen, I am very a very important joint! I hope this article has helped you understand me a bit better! If your dog ever suffers from any trauma or injury, take him to the vet as soon as possible. Early intervention in acute luxations can really help a whole lot and reduce future problems. For chronic problems, keep in mind that proper diet, exercise, supplements and pain relief, may help slow down the advancement of degenerative arthritis. Hopefully, a day will come when the disease can be better controlled, in the meanwhile, keep an eye on your dog and watch for signs of trouble. Disclaimer: this article is not meant to be used as a substitute for professional veterinary advice. 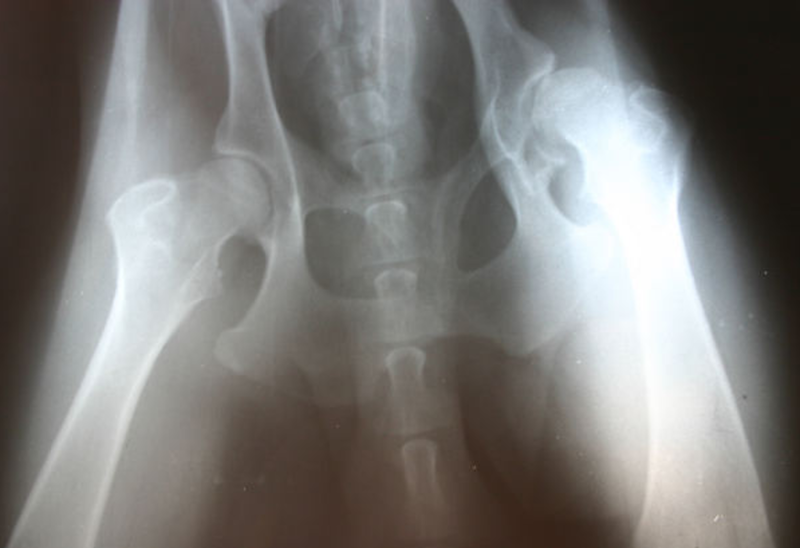 If your dog has hip problems, consult with your vet for advice and recommendations. DVM360, Canine hip dysplasia (Proceedings) by R.D. Montgomery, retrieved from the web on March 28th, 2016. Vet Surgery Central Total Hip Replacement, by Daniel A. Degner, retrieved from the web on March 28th, 2016.